1/22/2019 All is fine on this side of the screen other then work is busy with projects - no time to dedicate to swap-bot at the moment. Sorry if I haven't replied to messages - but I have been keeping an eye out and rating any cards that come in. Hi, My name is Sheli - I've lived in Alaska most all my life. My husband and I own and work in our little store called Alaska Transfers & Design in Fairbanks and live in the next town over named North Pole - and yes there is a Santa Claus house! Even reindeer! 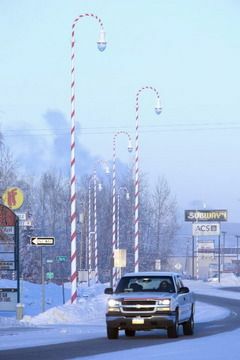 Some of the town is decorated year round and we have candy cane street lights. We send and receive all of our mail from our store in Fairbanks since it's more secure than our roadside mailbox out in North Pole. We enjoy spending the summers traveling in state as well as traveling through Canada on our way to visit the lower 48 to go antiquing and just seeing the sights. For pets we have 3 very spoiled cats who enjoy watching the many cool animals that visit our backyard - We are lucky that the area area we live is all left wild by the other home-owners and hopefully will stay that way, we enjoy the wildlife viewing. This summer we've had a boom year of bunnies! So the owls have been hanging around looking for a quick meal! Have had a few moose that came by for little visits and signs that possibly a fox or lynx was coming through too. crafting books - I have been collecting workbasket magazines. The older coats & clark ones are another line I collect and general crafting magazines too. The ads in the older books are great! Crochet is my favorite! I do other misc crafts, but crochet is my fav! Oh unless cooking is still considered a craft :) Love cooking, don't get to do much fancy stuff since it's just us, but if I find a fun recipe that I want to try out from my cookbook collection, I give it a whirl! We travel out of Alaska often in our RV so love RV themed goodies since we spend 70 days a summer living in it. Comment: Thank you! So sorry for the late rating. Comment: Belgian Waffles are just better. Why is that? Happy Holidays! Comment: Thank you for the great wolf postcard. Comment: Thank you for the great multiview from Alaska. Comment: Beautiful postcard, thank you. Comment: I'm so sorry for the delayed rating - I just found the postcard you sent me in amongst some catalogues at my house. I guess I received it a long time ago but my husband failed to let me know. THANK YOU!! Comment: Thank you so much for the postcard! I cannot imagine what -60 degrees feels like. I could barely handle the Michigan winters! Comment: Thanks for the sheep! Lucky you with the snow, but I am loving the sunshine here is So Cal. Shorts weather today! Comment: Thank you for your chatty notecard! T-day sounds like it will be delicious at your house! I hope you have a great time! Comment: Love the Alaska PC. I'll have to take your "advice" from your Lottery win purchase and visit one day! Thank you! Comment: OMG - I laughed soooo hard when you wrote "20* Nice day!" Today was 79* here. Thanks for the neat swap! I saw the word cafe!!!!! Loved your card <3 I can't believe the weather there, with 53ºF I'm already freezing XD. Hope you have a great Xmas and a Amazing New Year. glad to see u back!!! :) i have a few swaps ending in next few days!!! i will join yours as soon as i dwindle down. Got your just cause pc today showing glacier bay national park. How pretty! Thanks bunches. Have a good day.